I know it’s like shooting a howitzer at dead fish in an empty barrel to pick on Tyson, but I have a weakness. Forgive me. Hist tweet got the expected reaction, which prompted a wounded Tyson to expand his notion in a Facebook post. 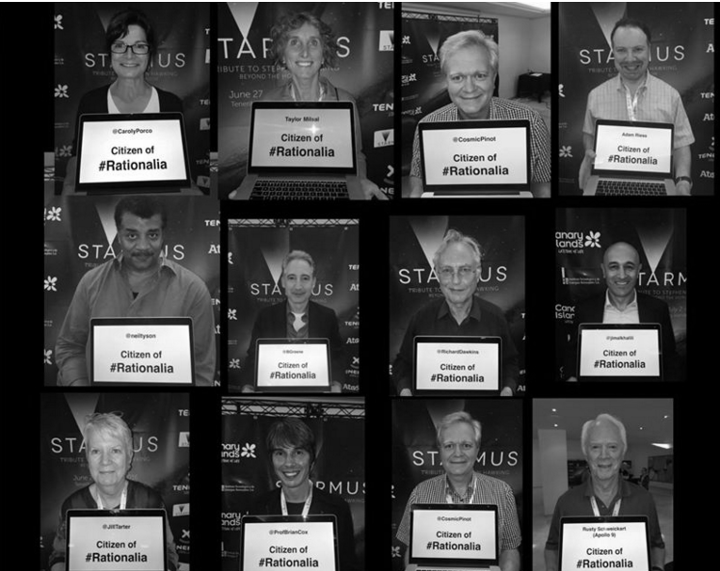 In it he said, “The concept of Rationalia began when Taylor Milsal insightfully mentioned at a cocktail reception of the Starmus Science Festival in Spain’s Canary Islands…” Lord. The only thing missing was his description of the (expensive) jewelry worn by the ladies. Also consider that across time and culture, morals have evolved, typically by rational analysis of the effects and consequences of a previously held moral, in the light of emergent knowledge, wisdom, and insight. The Bible, for example, is not a fertile place to find anti-slavery commentary, nor discussions of the equality of women. Religion is self-correcting, is it, Neil, old son? Forget it. It’s not true the Bible hasn’t much to say against slavery (and don’t forget there are many types of slavery). For instance, in Exodus 21 we find the rule, “Whoever steals a man and sells him, and anyone found in possession of him, shall be put to death.” Harsh, that. It is the case there’s nothing on the equality of woman, probably because woman are not the equal of men, and men are not the equal of women. Why expect falsities in the Bible? Inequality, not coincidentally, is also the scientific, rational, weight-of-evidence view. Not many bones there upon which to build a society. Not that Tyson doesn’t try. Unlike what typically occurs between adversarial politicians, in scientific discourse, when we disagree with one another there’s an underlying premise: Either I’m wrong and you’re right; you’re wrong and I’m right; or we’re both wrong. The unfolding argument actually shapes the quest for more and better data to resolve the differences so that we can agree and move on to the next unresolved problem. Fatuousness is the hallmark of the modern atheist. Another is monumental ego, the belief that he, the “rationalist”, is the first to think of ancient questions. And, what Neil, old man, if we’re both wrong? How can we know when we both claim to be right? I weep for Rationalia. In Rationalia, since weight of evidence is built into the Constitution, everyone would be trained from an early age how to obtain and analyze evidence, and how to draw conclusions from it. In Rationalia, you would have complete freedom to be irrational. You just don’t have the freedom to base policy on your ideas if the weight of evidence does not support it. For this reason, Rationalia might just be the freest country in the world. Just who picks the “weight of evidence”? Has Tyson never heard of scientists who disagree on even simple facts? Who arbitrates? Using what moral basis? Science can’t tell us. In Rationalia, for example, if you want to introduce capital punishment you’d need to propose a reason for it. If the reason is to deter murder, then an entire research machine would be put into place (if it did not already exist) to see whether, in fact, capital punishment deters murder. If it does not, then your proposed policy fails, and we move on to other proposals. One can only imagine the experimental apparatus this would demand. But I hope he’s not planning on using statistical hypothesis testing. Statistics has nothing, zero, nada, zip, zilch to say about cause (as this book proves). In Rationalia, research in psychology and neuroscience would establish what level risks we are all willing to take, and how much freedom we might need to forfeit, in exchange for comfort, health, wealth and security. Science, informed by the weight of evidence, mandates that you shall wear a sweater today. You have to freedom to do whatever Science tells you to. Just about what one expects from a guy whose dissertation was an exercise in counting stars. You know, this is a FABULOUS idea. The only thing wrong is that is there is nothing to catch the imagination. What if, just for imaginative purposes, we made up a “goddess” (wink wink, nod nod) that we could venerate, as a sort of symbol of course, to show how much we love Reason? We could call her, I don’t know, something like “the goddess of Reason.” And we could build pretend temples to her, where we could assemble to (everyone loves to assemble!) to show how reasonable we are. And then we could get rid of all silly arbitrary kinds of measurements, and base everything on mathematical perfection…. even the days of the week and the months of the year! Wouldn’t that be so much better? And then, unless of course someone could come up with actual evidence that one group or class of people is any different from the rest, we could make everyon have the EXACT SAME possessions and land, no more and no less, and make everyone call each other the same title. Maybe “Citizen” would be good, because we would all be equal citizens of Rationalia. But although we are all equal, there really IS a difference in brain power (plenty of evidence for that! ), so the people with the best brains should be in charge, and as they are best able to judge what everyone else should do, they can make up all the rules for how everyone else should think and act, and of course all the punishments for people who refuse. They might have to be harsh punishments at first, until people got used to the idea, but how bad could it be? Rational people are the BEST. Even if they went a bit overboard, it would correct itself because reason always DOES. I really think this could be GREAT. I wonder why no one has ever tried it before???? The weight of the evidence shows that Tyson is a Politically Correct government-worshiping poser. His worship of material and “rational,” inevitably leads to worshiping “Policy.” Note his capitalization of “Policy.” Policy is the Bible of these dangerous men. We’ve seen this play before. Marxism was an attempt to create Tyson’s Rationalia. The USSR, one of many examples, was an embodiment of Rationalia. Their natural extension of Marxism, Marxist-Leninism, required goons like Tyson. They were the “Elite Vanguard,” dragging the masses to Utopia, kicking and screaming, bleeding and dying masses. “In Rationalia, research in psychology and neuroscience would establish what level risks we are all willing to take, and how much freedom we might need to forfeit, in exchange for comfort, health, wealth and security.” This sounds very much like religion, with research being God. Except God at least allows people to opt out. Rationalia would be a dictatorship with those “special” people in charge (you know, the priests of Rationalism) and everyone else subjected to their iron-fisted rules. Personally, I don’t see that as a wonderful alternative to the current situation, although admittedly, the Priests of Rationalism are trying desperately to enslave the population in every single way they can in order to inpose their religious views on everyone. Isn’t this what Pope Francis is sort of pushing and what President Obama trying to make happen and what Hillary will continue? And isn’t this the vision of Teihard de Chardin? Somehow the results don’t correspond well with the vision. “Either I’m wrong and you’re right; you’re wrong and I’m right; or we’re both wrong.” He left out a fourth possibility-you’re both right. On reading that, I immediately thought of the Rudyard Kipling quote from the poem, “In the Neolithic Age”. Rationality unyoked from morality = cold utilitarianism. Why help the poor? Killing them off would result in more resources for the smart cool kids! Leviticus 25:44-46 & Ephesians 6:5 both explicitly establish the acceptability of slavery within limits. –	Modern morality expressly rejects slavery (including as a form of punishment; the closest we get are a mild version of what might be considered “chain gangs”). –	Curiously, preceding the U.S. Civil War those debating slavery’s acceptability, those both for and against it, quoted Biblical verses to support their mutually-exclusive moral conclusions on the matter. –	If one says science can be ambiguous about what’s right/best and that that ambiguity is a basis for ridicule…think about the debatable values defined by the Bible that can be so easily applied to support both contesting sides (slavery, good vs bad, isn’t the only such example)—one would think a credible reference for defining morality would not be so ambiguous on such important topics as to endorse both side of an issue. James 5:14: Is anyone among you sick? Then he must call for the elders of the church and they are to pray over him, anointing him with oil in the name of the Lord; and the prayer offered in faith will restore the one who is sick, and the Lord will raise him up. –	Obviously that moral approach to medicine is superior to the science-based medicine currently “practiced”…. but who here puts their health prospects on prayer without [science-based] medicine? What religion makes easy for its practitioners in numerous areas is provide an unassailable rationalization (deity-decreed [ultimate authority] permissions) to do what they want. Leviticus 19:19 Do not wear clothing woven of two kinds of material. –	This trivially easy requirement of women is ignored; even by the women Catholic laity who hand out the Eucharist…. Matthew 5:29-30: So if your eye—even your good eye—causes you to lust, gouge it out and throw it away. And if your hand—even your stronger hand—causes you to sin, cut it off and throw it away. –	There’s one with ample opportunity…but for all practical [all?] purposes never resorted to…. ADHERENCE TO A RELIGION’S MANDATES IS AN ALL-OR-NOTHING PROPOSITION…and for all practical purposes nobody claiming to endorse or practice religion does this. Not even close. Selective cherry-picking of divine mandates one agrees with and one doesn’t isn’t religion — its hypocrisy. Revelation 3:15-16: I know your deeds; you are neither cold nor hot. How I wish you were one or the other. So because you are lukewarm — neither hot nor cold — I am about to spit you out of My mouth! Unlike the holier-than-thou goody-two-shoes , N.DeG.T. doesn’t breach the criteria for being such spittle. Religious hypocrites can think about that. Ken, you really shouldn’t quote the bible when you have no clue on how to interpret the passages. You obviously have no idea when hyperbole or subtlety is being used. Ken: You consistently ignore atheists and rationalists contradictions, yet complain about Briggs ignoring religious contradictions. Can we expect a more balanced view from you in the future or are you sticking with “I can be contradictory or leave out information but no one else can”? The weight of evidence on acceptable foodstuffs leads quickly to human beings being used for food. After all, genetically and otherwise, pigs and people are closely related, and pigs are quite tasty. Maybe humans are, too. Using the weight of evidence as proof of anything can lead to some slippery slopes. There have to be morals and rules of conduct which may or may not be rational. As usual, it depends on who is being rational, or whatever rationality is accepted to be. You would have a tough time rationalizing abstract thinking if you depend on physical evidence. Sheri talks about a goddess, so how do you accumulate a weight of evidence to support goddess-hood? I wonder if mathematics would be in trouble, too, because a sizable proportion of the population do not understand the subject? In contrast to Tyson’s idea of a really free country, I think a country based on free market principles is the best. However, once you launch such an entity, I am sure a government would pop-up to wreak regulations and taxes on those who do well. That Exodus 21 quote presupposes the man is already a slave when he gets stolen. So it doesn’t actually address slavery itself. Sheri: right on about that Ken guy! Humans are reportedly quite tasty. Bob: Gail spoke of a goddess. I suspect mathematics would not be in trouble because only the privileged elites would be allowed to learn it anyway. If a population understands math, they are much more difficult to fool. That’s fairly evident today where debt, taxes, welfare and global warming are all just magical concepts to many, many people. Rationally, it makes sense to keep most of the population saying “It is good to be a delta” and drugging them. Then everyone is happy and having a wonderful life. The weight of the scientific evidence shows that Tyson is nothing more than a pile of molecules. That’s right, “nothing more”. It would be irrational to treat him any differently than the pile of molecules that people unfortunately step in while walking across their backyard. How do you like them evidenced-based apples, Tyson? “Science” may say nothing about morality; but the scientific method does: it says truth is both right and self certifying. I’d like to apply for a Rationalistan Associates Training Scholarship (RATS) to conduct evidence based research to discover whether capital punishment deters murder. If killing off ten percent of the population, leaving 90 percent as a control group, reduces annual murder rates by ten percent, then obviously that should determine conversion of the experiment to government policy. Under Rationalistan’s constitutional first fundamental principle, “Diversity is equivalent”, no profiling will be employed in selection of the ten percent for the research experiment. There is no objective consistent criteria/manner of interpretation one can write down in advance and then apply. The necessary method of interpretation amounts to ‘whatever it takes to make the preconceived story work out.’ And that holds true if one reads in the original Greek (for the NT), so translation issues are not a factor in this regard. One must start with an understanding of the entirety of the story, and then, apply “hyperbole or subtlety” to force it all to work out right relative to the pre-established plot – nobody can start with the stories, historical context, etc. and back into a coherent story. Many objective analysts have addressed this elsewhere and in great detail (entire series of books, written over the past 100 yrs or so); there’s no need to elaborate here. The splits from the Catholic Church & subsequent schisms & multiplicity of denominations—all from the same source reference—illustrate the diversity of opinion regarding proper interpretation…and each & every one is certain they’ve used “hyperbole or subtlety” [or whatever one cares to call it] correctly. Most MUST be wrong because too many doctrines within all those denominations are irreconcilably mutually exclusive (e.g. evolution-R. Cath. vs Intel. Design (evangelical); gays ok (some Episcopalian & some others) vs gays not ok (other Epis. & others); Adam & Eve and Noah/flood – metaphorical story vs. literal story; etc., etc.). Does that ever-growing conflict in doctrinal viewpoint [not to mention increasing social strife] arising from the same reference documents really look like the handiwork of an ‘almighty’ Divine author as portrayed in Summa Contra Gentiles??? Yeah, so…the argument sort of presented, about ignoring other’s contradictions but harping on Briggs’ as if such associations are somehow relevant [or if theirs & his are both equally bad then his ought to be tolerated] reflects the exercise of a flavor of the same fallacy Briggs addressed here (among other places): http://wmbriggs.com/post/12648/ (The So’s-Your-Old-Man Fallacy). If Briggs is going to present some half-baked rationale, I’ll call’m out on it – even when I agree with the bottom-line. Especially when I agree with the bottom-line. I’m not willing to accept some highly flawed justification just because I like the conclusion reached (that’s mindless cultish fanaticism, intellectual masturbation, masquerading as but really superseding intellectual rigor). No argument/rationale is better than a bad one because a bad argument taints the bottom-line and those that hold it in the broader court of public opinion. A bad argument, in other words, helps the opposition. Got it Ken. You are going to “call Briggs out”. I’m so happy for you. Consider the U.S., and pretty much every other first-world country — each has grappled with similar, many including identical policy issues (e.g. capital punishment) as dismissed as ‘too hard’ here via judicial & political systems that already ‘weigh the evidence’ and then set policy accordingly. It’s called representative government and separate judicial systems. No “experimental apparatus” needed. It exists and is functioning [there’s certainly room for improvement], but not everywhere. How, living in a country that has exercised pretty much the same policy approach espoused by Tyson [Tyson is unmistakably presenting a kind of thought experiment], could the likes of Briggs, etc. completely miss the history & method in actual practice Tyson mentioned?? One facet of the U.S. government was built to do what Tyson advocated — its intrinsic to the design of the U.S. Government. Briggs, et. al., missed this somehow! More importantly, how could they miss the obvious implication: The real impact of such a policy approach would be truly felt in countries where political authority is intimately linked to religious authority & religious doctrine (e.g. the Middle East), and/or, where economic & political ideology form a doctrine that rejects evidence to the contrary of that doctrine (e.g. socialism, communism, etc. … observe the changes in China, where communist rule is evolving–based on a weighing of the evidence–toward a much more capitalistic system and in so doing is reaping many of the economic rewards). In such a country with a basic policy as Tyson recommended the extreme views of one like Bernie Sanders [and Putin] would have no chance, and religious extremism would be severely squelched, making airport lines & delays [for example] much shorter/briefer, etc. Are you really that obtuse? Or are you just pretending to be? The Policy is made based on the will of the electorate, or the will of the lobbyists. Thus, Policy is controlled by an elected body, which then offloads enforcement onto an “elite” bureaucracy. If you’re not familiar with the American bureaucracy, then you may well believe that they rule based on “evidence.” If you are familiar with our system, then you know that they rule based on their biases and ideology. See my earlier comment about the systems that have been based on Tyson’s Rationalia–the USSR was the mother of them all. And Communist China is the bastardized remains of Rationalia. The common denominator of such systems is not their use of “evidence,” but rather the Elite Vanguard–the self-appointed Tysons and his ilk, who decide what is valid “evidence,” and what is not. In Obamaville that statement, alone, could get me axed! Briggs’ blog is the place for ilk spotting. I’m never disappointed. Q: What do Briggs and deGrasse Tyson have in common? A: Apparently, they both have ilks. The weight of evidence I’ve seen shows Progressives generally don’t like constitutions. At least those they can’t modify/corrupt to their own liking. So lets modify Tyson’s, OK? Sometimes it seems you need a refresher on the differences. Gail’s done a pretty good job on Rationalia. It’s all been sold to the masses, or proles, many times before. It invariably results in a “rational” elite “having” to impose their rationality on the “great unwashed”, the unrational, the plebian profane, and exterminate or enslave them with “re education”, degenerate “entertainment”, diseducation and mindless inane slogans (political correctness as we know it these days). It’s the natural result of rationalising illogical ideologies based on false premises. The main false premise is that reality is “becoming” and it can be tailored by a judicious selection and interpretation of phenomena and with dialectics. The dialectical “creation” of truth and virtue supposes that a primitive proposition (thesis) automatically generates it’s anti-thesis and the competition between thesis and antithesis results in a syn-thesis which is then a new thesis and the whole process continues ad infinitum. The likes of Tyson and his like dreamers are what Lenin called “useful idiots”. Lenin knew that the plutocratic oligarchy already exists (which is fawningly admired by Carroll Quigley in his “tragedy and Hope”) but those pesky Christians with their magnanimously self-sacrificing Messiah and their intransigent view of reality as that which is are a serious impediment to the full installation of the “New Order” on a World scale. The quoted rule in Exodus 21 is not “against slavery” based on my reading. It states one shall not steal other people’s slave. “Steal” is the key word. I just opened my daughter’s (Catholic) bible, and read the entire chapter of Exodus 21. Though I could not find the exact words, it seems to confirm my reading. I wanted to find a link to this chapter but decided not to because it is not a pretty chapter. Please don’t tell me you have no idea what Tyson meant by saying “the equality of women.” Read Exodus 21. Not going to waste my time to do what you have done to Tsyon’s words. The above statement obviously says nothing about cause. In methods of causal discovery, statistical evidence and empirical facts will play a role in constrain the set of viable casual belief or causal model. There is a vast amount of literature in causation and causality; see here, a book I’d highly recommend. Supposing you want to introduce Capital Punishment because you want to get revenge? That’s a reason. I’m just wondering how you would ‘research’ that. Perhaps only ‘reasons’ which are capable of being ‘researched’ will be accepted as ‘valid reasons’? According to the available evidence (at least in the eyes of this reporter), self-professed citizens of Rationalia have a deep aversion to looking at the evidence. Bob: Fortunately, this is not Obamaville, for soooo many reasons! Gary: I like your idea! Or maybe we could just ignore the constitution when it suits us. That’s tried and true—no additional research needed. JH: Exactly how do statistics prove cause? The only actual causal agent occurs 100% of the time and you don’t need statistics for that. Partial causes can only be “known” if you know all the causes (see any personal injury lawyer’s website for evidence of why this is true—failure of people to understand this obvious fact makes personal injury lawyers very, very rich). All: Rationalia, if it’s based on science, actually should result in a society where might makes right and only the strong survive. Humans are part of the animal kingdom and this is the Darwinian way. Trying to save the defective members of society is anti-evolution and results in a weaker species. No rational species wants to make itself weaker—no irrational species wants to do that either, as far as Darwinian evolution postulates. So, survival of the fittest is the only rational, science based way to live. The only actual causal agent of what? The only agent? Is it a priori knowledge? If it is not, how would you go about developing a causal model and finding evidence of causality. My statement that “in methods of causal discovery, statistical evidence and empirical facts will play a role in constrain the set of viable casual belief or causal model” is not equivalent to saying “statistics prove cause”. If we know all the causes, then obviously partial causes can be known (assuming a “partial cause’ is one of causes in the set of ‘all causes.). However, a partial cause can be known without knowing all causes. On an individual level, for example, it’s relative easy to establish whether smoking causes one individual patient’s lung cancer without knowing all possible causes. On a group level, it’s a much harder task. Check out the book written by seasoned philosophers in my previous comment. If you cannot check it out from a library or don’t wish to purchase the book, use books.google.com, which allows you to read part of the book. Go beyond, way beyond the rhetoric of “statistics cannot prove cause” or something of same sort. Reading the book will probably help organize your thoughts and sort through Briggs’ book. JH: Thank you for the suggestion. I have many books written by “seasoned philosophers”, text books from college. I will check out your suggestion, however, because it might help me understand your position somewhat. I would note that I was taught that statistics cannot prove cause many years ago. I was surprised to find how much academia had changed and how accepting they seemed of what was to me very bad statistics and science. It’s not that what Briggs is writing is new and I just don’t understand statistics, it’s the whole discipline seems very, very changed and I can’t see it being for the better. Somebody should ask Tyson if I should avoid Blacks for their significantly lower IQs and representation in violent crime. And if they should be purged from America.